“WE W ARN that individuals who violate covenants of chastity, who abuse spouse or offspring, or who fail to fulfill family responsibilities will one day stand accountable before God. Further, we warn that the disintegration of the family will bring upon individuals, communities, and nations the calamities foretold by ancient and modern prophets.” (Full Proclamation here). fn 1. At the end of September, twenty years ago, the Church of Jesus Christ of Latter-Days Saints released, “The Family: A Proclamation to the World.” Much has been said and written about this prophetic document. I wanted to add my voice and experiences in how much this document is divinely inspired and can help us, even when faced with family situations that cannot be farther from the ideal. Living and learning of the gospel and how it pertains to families is the key, and the Proclamation can guide our study. a. A husband and wife are yelling at one another, threatening to hurt each other, and throwing things. Their teenage daughters are home, staying upstairs and trying not to be involved. b. A young pregnant mother is on her to way to church. Her husband, a highly educated engineer, won’t let her take her older children with her, so they are staying home. They are fighting and it escalates. He is telling her yet again what a horrible mother she is. As she is getting in the car to leave, he emerges from the house with a gun. She begins screaming for help. He shoots her, killing her and the unborn child, and leaving their other three children motherless. c. A husband becomes irrational and irritable when he drinks, which is often. One night it escalates, and he takes out a gun and shoots toward his wife. He tells her later that he would never hurt her, that the gun wasn’t loaded. d. A father of five children and his wife are in an argument. She is screaming at him and belitting him, telling him that he is a terrible husband. He loses his temper and throws a shoe at her, breaking a glass. e. A young woman sends graphic texts to her on-again, off-again boyfriend, showing him pictures of herself with other men. She also taunts him, saying that he is good for nothing, that no one will ever care for him and that he should just kill himself. f. A grandchild lives with her grandmother. She is so sick and tired of cleaning up after her grandmother, who can’t seem to do anything right. The only thing that makes it worth it is that she has access to her checking account so she can pay herself for putting up with her grandma, who can’t even seem to clean up after herself or make it to the bathroom sometimes. The granddaughter punishes her when she has an accident. After all, how else will she learn? She tells her grandma all the time that if granddaughter ever just leaves, grandma will die alone and no one will care or take care of her. g. A mother is exhausted and her children are out of control. When she walks in on another disaster in the playroom, she completely loses control and drags her two children by their wrist into their rooms, throwing them inside after spanking them each several times, until her hand hurts. She screams at them and tells them just what she thinks of them and that they won’t be getting any dinner if they can’t even behave for a few minutes. h. A teenage boy can’t stand his father meddling in his business. The father sees that his son has been doing drugs in his home and treating his family with disrespect. The father has had enough. He grabs his son to teach him a lesson. The two escalate into throwing shoving and throwing punches, until the father smashes his son’s nose. The son runs out the door. i. A woman goes to the store to get groceries. She knows she is to call her husband when she arrives at the store, and then call again when she is about to check out. He stays on the line with her while the clerk rings up the groceries and gives her a total. When she tells him the amount, only then does he transfer the money to the account. October is Domestic Violence Awareness Month. See fn.2. In my work as a family law attorney, I have unfortunately heard many stories of abuse. I have found that most often, those that I am most concerned about are not even entirely aware that what they are experiencing actually IS abuse. While it can seem clear on the outside, it is important to understand that the culminating experience that is clearly abusive, comes after long and varied cycles of abusive behavior that escalates in such a way that a person in the middle of it becomes accustomed to it. Thanks to http://ccwrc.org/about-abuse/about-domestic-violence/ for the helpful graphic. 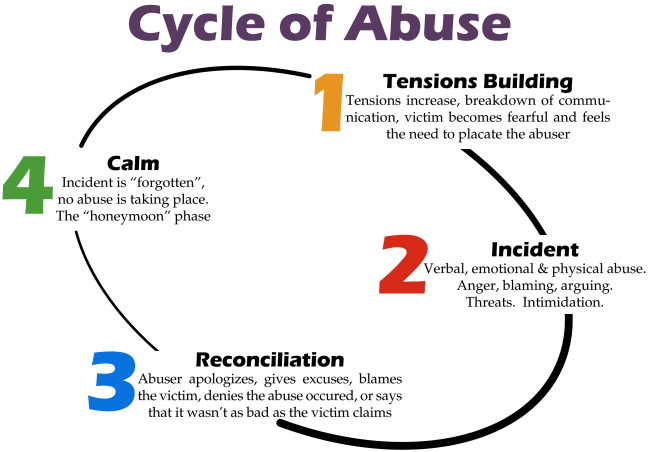 A part of the victim seems to be aware of the cycle, but persons who are truly in an abusive relationship often seem to say the words that they think others want to hear, but are not actually able to fully grasp the meaning of what they are living on a daily basis. Part of her just couldn’t seem to really believe that someone that she loves could actually really hurt her or treat her this way, and victims have a difficult time believing that it will usually happen again and again. Admitting that the situation might be out of her power is more frightening than maintaining even a false sense of control. It is as if she lets her mind think that the worst could have happened in that situation, she will be unable to cope with the loss of delicate equilibrium she is so desperate to maintain. There are many, many kinds of abuse, abusers, and victims, and an extensive study goes beyond my purpose today. Rather, I want to make four points to anyone playing any role in an abusive situation, which is likely all of us if we truly understand the spectrum of healthy and unhealthy relationships and are honest with ourselves. 1. Abusive family relationships are not new or hidden from the Lord. He is aware and loves all His children. It should also come as no surprise that they are found in every kind of family, from the very religious to the non-religious, from the outwardly seemingly-perfect LDS home to the outwardly seemingly-chaotic LDS home, or Catholic home, or Protestant home, or non-denomintional home, or atheist home. In fact, there are many scriptural examples. Consider for a moment scriptural descriptions of domestic violence. First, there is Laman and Lemuel’s interactions with their family. We know that there was a beating 1 Nephi 3:28), a binding and an attempt at murder (1 Nephi 7:16-19), a threat against not only Nephi’s life, but their own father’s life (1 Nephi 16:37-38), a desire to throw Nephi into the sea, (1 Nephi 17:48) and severe binding that caused swollen and sore ankles (1 Nephi 18: 11, 15). Joseph of the Old Testament was loved by his father, but his brothers “hated him, and could not speak peaceably unto him.” Genesis 37:4. His brothers conspired together to kill him, and eventually were willing to sell him into a life of slavery. Even our first parents, Adam and Eve, had Cain and Abel for children, with Cain taking the life of his brother out of hatred and jealousy. Genesis 4. All of this is not to somehow say that abusive family relationships are normal, or of no concern. On the contrary, such behavior and actions are damaging to the victims, to the abusers, and to everyone who knows and loves them. It is significant that in the beautiful doctrine in the Family Proclamation, abuse is singled out for a serious and grave warning. It is not the Lord’s way. It is not how family relationships can and should be. The scriptures teach us, “Husbands, love your wives, and be not bitter against them,” and “fathers provoke not your children to anger, lest they be discouraged.” (Col. 3:19, 21). 2. Heavenly Father knows and understands where you are, and what your heart feels. The Atonement is for you, whether you are an outside observer who might feel powerless to stop what you are afraid is happening, whether you are a victim who is struggling to know what part of responsibility (if any) is yours, or whether you know you are an abuser, or are afraid that you might be an abuser. One important thing that all of us must understand is that abuse in a relationship is on a spectrum. If someone has been in a situation for some time, understanding about what is a healthy relationship and what is not can become confused. A helpful site that includes quizzes about this spectrum can be found here: Relationship Spectrum Quiz. Now that I am apart from the situation and no longer an exhausted mother of young children, I can think back to times when I did and said things that were further on the scale toward abuse than I would like to admit. I am so sorry and I feel so ashamed of the times that I treated my children (and Heavenly Father’s children) in a way that caused sorrow. My harsh words or tone did nothing that created good or taught as our Father would have taught. I don’t like thinking about it, and it’s easier not to be honest with myself about my shortcomings, but that doesn’t help me to repent and become better. It is important to remember that in the descriptions of real-life situations above, it is easily apparent that some of those scenarios are much farther on the abuse scale than are others. Some of the victims are men, and some are women. There are varying ages of abusers and victims, and sometimes, the roles might even change because the relationship is simply toxic. No matter the specifics, I don’t believe any of those scenarios are pleasing to the Lord. Through the Atonement, joy, respect, and love in family relationships can be found by following the principles of the Gospel. Through study and effort, we can learn more about how “We are to lead our families by persuasion, by long-suffering, by gentleness, kindness, and meekness, and by love unfeigned.” (D&C 121:41–42). We can start where we are, and wherever that is, we can become better and make progress on our path toward joyful discipleship. 3. Get professional help. The caliber of help you need is going to depend on your role in the situation and the depth and breadth of the circumstances. First, if you recognize that you or someone else is a victim of serious abuse with a reasonable likelihood of physical or mental harm, check out resources like the National Domestic Abuse Hotline at: Hotline. A warning appears if you visit this site, telling you that it’s possible that your computer could be monitored by your abuser, and advising to call 1-800-799-7233 (SAFE) if this concerns you and you feel that visiting the site could put you in harm’s way. Recognize that sometimes in the scriptures, the right answer was to leave the situation entirely. For example, Nephi took those that followed him and left his brothers because they were going to harm him. 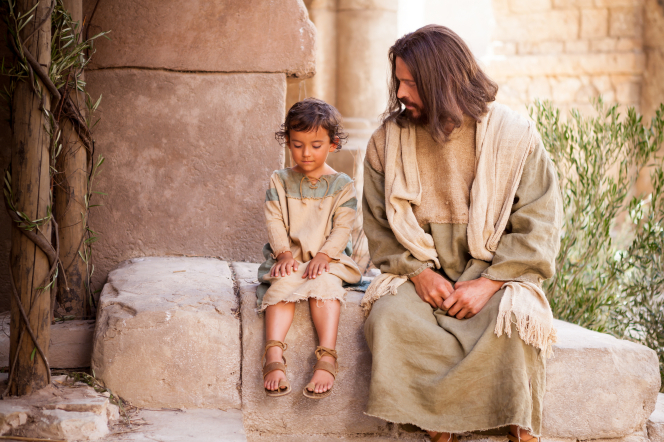 It could also be said that Heavenly Father allowed Joseph to be taken away from his brothers, even though it did not seem like a blessing at the time. In the end, the brothers were sorrowful, and Joseph was able to forgive them. Sometimes getting out of the situation is a necessity. Professionals can help you if this applies to you. You might also check for Women’s and Children’s organizations or Domestic Violence shelters in your geographical area to discover resources. You can often get legal help through your state Bar Association directing you to attorneys that will help with getting restraining orders or protective orders. Professional counselors can help with identifying behaviors and triggers, and helping to teach positive interpersonal relationship indicators and behaviors. Police often have special units that emphasize helping victims in these situations. Do not discount the value of going to people who are trained to help. Utilize the tools that are in place to help those in need. Second, if you are trying to help someone, it can be very difficult and even frustrating. An abuse victim is often overwhelmed by fear, which can govern the person’s every move–a fear of further violence, the unknown, the person’s safety and the safety of the children involved–do not underestimate the effects of fear. Victims are usually filled with conflict, remorse, and concern. They may feel resigned and hopeless, and feel and be somewhat trapped emotionally and financially. Be careful not to place demands on the victim’s decision-making and willingness to leave the situation in order for the victim to have your support. Abuse victims are most vulnerable and likely to be hurt at the point of separation and right after leaving an abusive situation. The fear is real. Often, victims are incredibly isolated from the world, including their own family. Be patient. It took time for the situation to develop. It will take time for the victim to be able to leave it, but starting to recognize there is a problem is the first step. Hearkening back to Nephi, he did not leave at the first sign of abuse either, despite how “large in stature” he was. Also know that in any human relationship, there are often things that the victim did that weren’t “perfect” either. One example might be where the wife is belittling the husband from the scenario above, and then he throws a shoe toward her in frustration and anger. Who is at fault? Who is the abuser and who is the victim? As a bystander/helper, it is not up to you to figure it out. The important thing is that the family needs to recognize that they need professional help to stop the cycle of toxic interpersonal relations. 4. 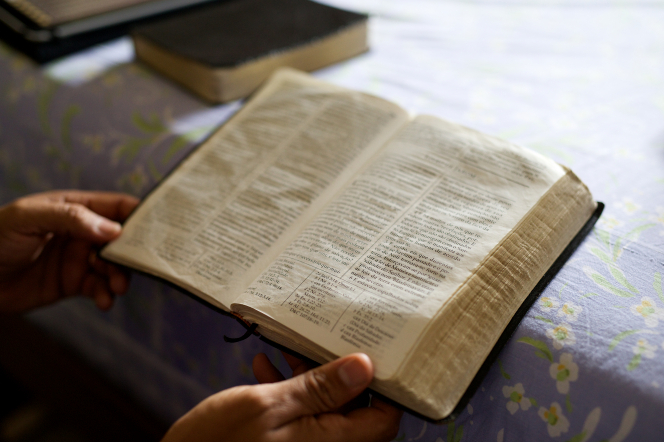 The Church offers resources of spiritual guidance and protection through gospel teachings and priesthood authority. These resources should not be viewed as a replacement for professional help, but rather as an important partner in healing,. Bishops hold the keys of repentance and help. They can connect the family with LDS Social Services in some instances. 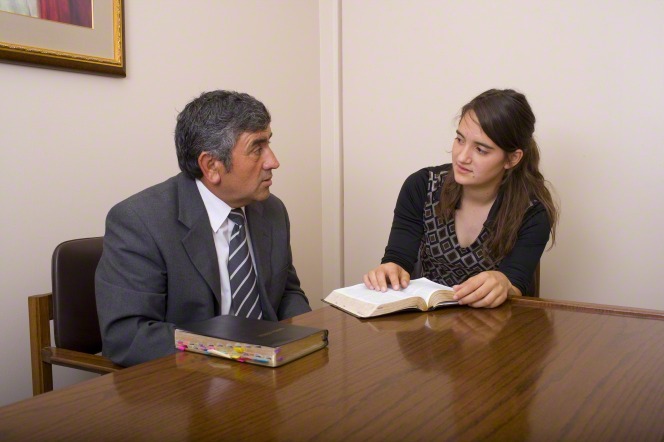 If the situation is not critical and life-threatening, but more like the routine family drama that most of us face, following the wise counsel of our leaders in learning how to more effectively strengthen our own spiritual reserves through prayer and scripture study can help us to keep more self-control in our interactions with our loved ones. “Let husband and wife never speak in loud tones to each other, ‘unless the house is on fire’” (Stepping Stones to an Abundant Life, comp. Llewelyn R. McKay , 294). Focusing on gospel teachings of reverence and love, and especially going to the Lord in prayer and thoughtfulness to ask for forgiveness in the times that we fall short can bring joy and peace to our hearts. 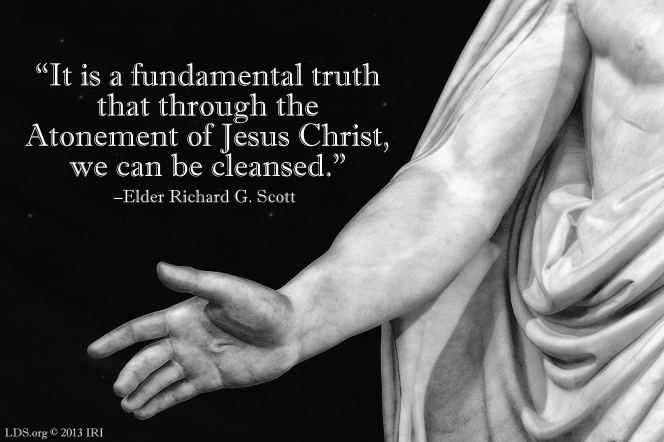 The Sacrament can be a time of self-reflection on what we can do better. “But ye will teach them to walk in the ways of truth and soberness; ye will teach them to love one another, and to serve one another.”(Mosiah 4:15). Hopefully, there is no serious abuse happening in the lives of those whom we love, but we can all take this time to reflect on the Proclamation and National Domestic Abuse Awareness month, and set a little goal for ourselves to be a little more kind, speak with a little more softness, and to serve each other with a little more gentleness and meekness. As we do so, our homes and our lives will be blessed, and our joy will increase. justice. If you would like to learn more, please consider starting with:  https://www.lds.org/topics/abuse?lang=eng that contains helpful advice, information, and links. Extremely helpful information. Thank you. Great post, Natalie. I love all the scriptural references to abuse and how those families dealt with it.